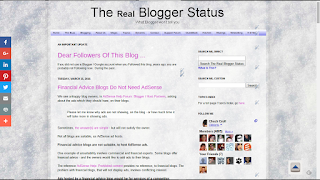 Not all blogs are suitable, as AdSense ad hosts. 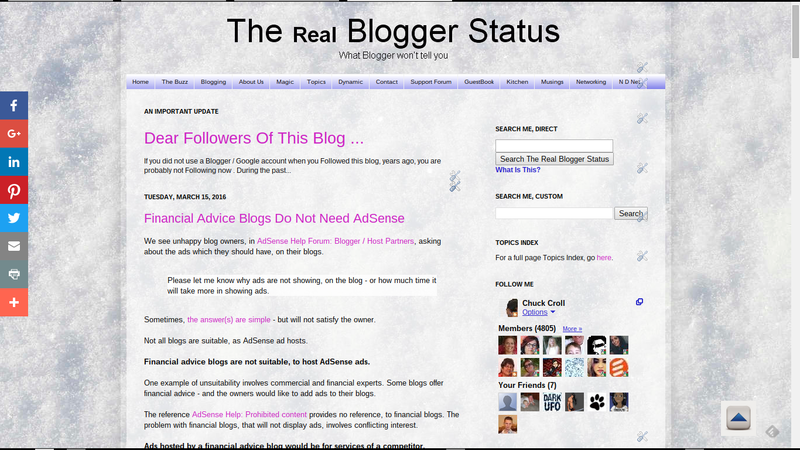 Financial advice blogs are not suitable, to host AdSense ads. One example of unsuitability involves commercial and financial experts. Some blogs offer financial advice - and the owners would like to add ads to their blogs. The reference AdSense Help: Prohibited content provides no reference, to financial blogs. The problem with financial blogs, that will not display ads, involves conflicting interest. Ads hosted by a financial advice blog would be for services of a competitor. If ads were to be displayed, on a financial expert blog, they would be for competing financial advice services. No ad manager, however, would pay for his clients ads to be hosted on a website belonging to a competitor. In order for ads to be meaningful, on a financial advice blog, the financial expert would have to be making very little money. This would conflict with the business strategy of any financial expert. Anybody who needs income from ads, to support a financial advice blog, does not make enough money - and therefore is not worth paying for advice. And nobody will pay for ads, from would be customers of someone who publishes a blog with bogus advice. Anybody who publishes a blog with financial advice does not make enough money. Any successful financial expert makes far more money, from providing advice, than income from any website which hosts AdSense ads. Anybody who can successfully provide financial advice is much better off spending more time providing more financial advice directly, to qualified customers. Nobody who has enough money to interest a successful financial adviser is going to be surfing the web, looking for advertisements selling financial advice. This consideration, too, is going to prevent any web savvy ad manager from paying any clients ads to being hosted on a website owned by somebody publishing dodgy financial advice. There is simply no market, for websites providing financial advice, in hosting AdSense content. Pure and simple. Some financial advice experts would like to finance their websites, using AdSense ads hosted on #Blogger blogs. They do not consider that there is no market for AdSense hosted financial advice ads - because anybody who sees an income improvement, from AdSense, is not making enough money from financial expertise - and is not worth paying for advice.